In the two years that Natalie Gerhart has lived in Omaha, she’s become a faithful volunteer at OPL, where she volunteers for a couple hours every Wednesday at W. Dale Clark Main Libraryopens a new window. Gerhart moved to Omaha to teach at Creighton University, where she is an assistant professor of information systems in the Heider College of Business. 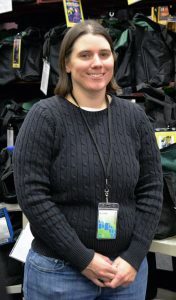 Gerhart began volunteering at the Denton Public Library while she was a graduate student at the University of North Texas in Denton, Texas. While working to obtain her doctorate degree, she assisted patrons with technology-related needs. Whether helping someone print from a library computer or teaching classes on Excel and PowerPoint, Gerhart enjoyed feeling that she added value to the library so much that she opted to continue volunteering at her local library when she became an Omaha resident in 2016. When OPL’s book club coordinator April Underwood first received Gerhart’s resume, she remembers being impressed. “I thought she was totally overqualified and that it was so awesome that she wanted to volunteer with us,” said Underwood. Gerhart’s business acumen has proven useful in assisting Underwood with maintaining and optimizing OPL’s book club bagsopens a new window. In any given week, that may entail running reports on book club bag usage, preparing book club bags for borrowers, or making instruction sheets for staff and volunteers who assist with book club materials. “She contributes so much to our unit; the work that she does helps things run smoother, faster and easier,” said Underwood. To Gerhart, volunteering is just another way for her to use her skills to contribute to the public good. She doesn’t belong to any book clubs herself, but she uses the library increasingly to check out digital materials like audiobooksopens a new window, which she likes to listen to while she drives. If you or someone you know is interested in volunteering at OPL, visit your neighborhood branch or omahalibrary.org/volunteeropens a new window for more information.